Mid-April: Celebration of the lunar new year all over Laos but especially in Luang Prabang and Vientiane, both of which have elephant processions. It is a time when the old year is washed away and the new is welcomed: homes are cleaned, people wear new clothes and Buddha images are ritually washed. 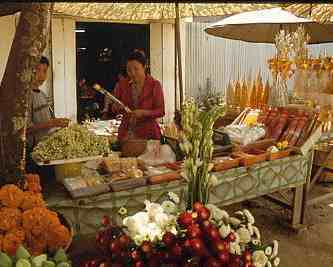 Flowers and fruit are offered in temples, and the street fun includes the none-to-ritualistic dousing of others with water. July: The start of the monks' traditional three-month rainy season retreat. It is also the time when boys and young men go into the Shangha for a brief spell or maybe for longer. Boun Bang Fai  the Rocket Festival  harnesses village and temple to common ends, drawing together the community, family and friends at the beginning of the rainy season between the middle of May and early June. The bang fai are made from bamboo or plastic tubes stuffed with gunpowder made from sulphur and charcoal, with a long stick for some hope of stability and bright decorations. Usually, the production of the bang fai are cooperative efforts between monks, novices and villagers. The festival's origins are lost in time and there are competing explanations for its purpose. Some say it is to ask the gods for rain, others that it marks Buddha's birth, enlightenment and passing on  and the more pragmatic argue that it is just for the villagers' entertainment before growing rice. It is certainly a colourful, joyful festival with villagers hosting relatives and friends for the day and a Bang Fai procession. The bang fai muen  the smaller rocket weighing in at a mere 12kg  and its bigger brothers are followed around the temple by dancers, merrymakers and people with huge representations of male and female organs to shock the gods and provoke lightning and rain. At the end of the procession, comes the competition. The rockets are set up on launch structures in a rice field on the edge of the village. Tension mounts  the bets are laid  and the winner is the one whose rocket goes furthest along the course. The loser, whose hopes explode or just fizzle out, pays the price  sometimes with a good dunking in the buffalos' pond.